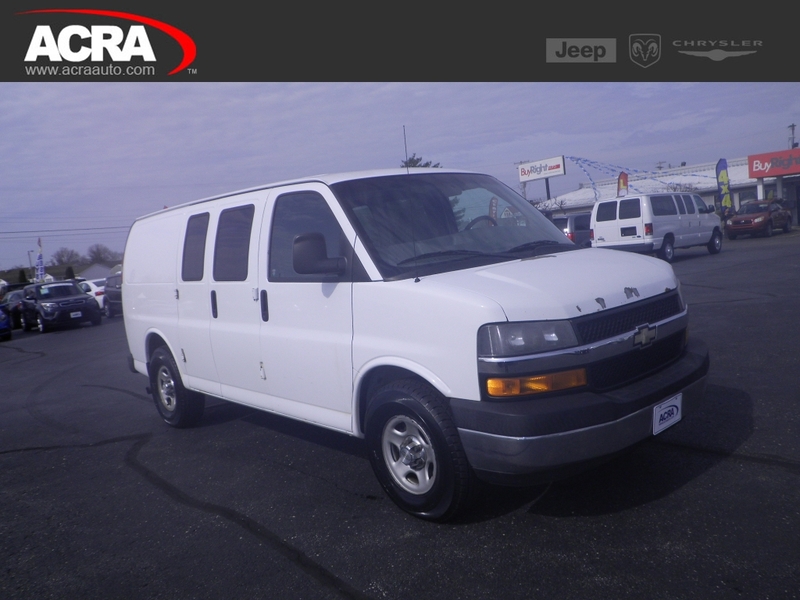 Used 2016 City Express Cargo Van, 42,969 miles, options include: Fog Lights, Power Windows, a Roof / Luggage Rack, Rear Parking Aid, a Continuously Variable Transmission, Electronic Stability Control, Cloth Seats, Daytime Running Lights, Traction Control, Steering Wheel Controls, a Electronic Messaging Assistance, Front Wheel Drive, an Anti Theft System, a Spare Tire (Full Size), an Auxiliary Audio Input, Power Mirrors, Power Locks, a Fourth Passenger Door, a Cell Phone, Bucket Seats, Tinted Glass, a Tire Pressure Monitoring System, Bluetooth Connection, Cruise Control, a Drivers Air Bag, a Gasoline Engine, Steel Wheels, an Auxiliary Power Outlet, Air Conditioning, an AM/FM Stereo, Anti-Lock Brakes, Adjustable Head Rests, a Front Head Air Bag, a Single-Disc CD Player, Intermittent Wipers, a Passenger Air Bag Sensor, a Digital Clock, a Trip Computer, a Center Arm Rest, a Tilt Steering Wheel, a Beverage Holder(s), a Trip Odometer, a Passenger Air Bag, and Power Steering. This 2016 Chevrolet City Express Cargo Van FWD 115" LT, Stock number 18837 features a Designer White exterior. Factory equipped with an impressive 4cyl, 2.0l, 131.0hp engine, an transmission, xtronic stepless gear transmission and front wheel drive, this Chevrolet City Express Cargo Van is ready to conquer the roads! Contact us today to schedule a test drive of this 2016 Chevrolet City Express Cargo Van FWD 115" LT! Or stop in at 2820 North National Road Columbus, IN to check it out in person! Additional Equipment: Appearance Package / Includes (v35) Body-color Front And Rear Bumpers, (d75) Body-color Door Handles, (pb1) Wheel Covers And (v22) Chrome Grille With Black Accents. Additional Equipment: Siriusxm Satellite Radio / Is Standard On Nearly All 2016 Gm Models. Enjoy A 3-month All Access Trial Subscription With Over 150 Channels Including Commercial-free Music, Plus Sports, News And Entertainment. Plus Listening On The App And Online Is Included, So You'll Hear The Best Siriusxm Has To Offer, Anywhere Life Takes You. Welcome To The World Of Siriusxm. Ship Thru Codes: Ship Thru, Produced In Mexico And Shipped To Adrian Steel, Wentzville, Mo. / Returned To Wentzville Assembly For Shipping To Final Destination. Ship Thru Codes: Ship Thru, Produced In Mexico And Shipped To Auto Truck, O'fallon, Mo. / Returned To Wentzville Assembly For Shipping To Final Destination. Ship Thru Codes: Ship Thru, Produced In Mexico And Shipped To Leggett And Platt Cvp, Wentzville, Mo. / Returned To Wentzville Assembly For Shipping To Final Destination. Ship Thru Codes: Ship Thru, Produced In Mexico And Shipped To Midway Specialty Vehicles, Elkhart, In. / Returned To Ft. Wayne Assembly For Shipping To Final Destination. Ship Thru Codes: Ship Thru, Produced In Mexico And Shipped To Knapheide Truck Equipment, St. Peters, Mo. / Returned To Wentzville Assembly For Shipping To Final Destination. Ship Thru Codes: Ship Thru, Produced In Mexico And Shipped To Manheim St. Louis Auto Auction, Bridgeton, Mo. / Returned To Wentzville Assembly For Shipping To Final Destination. Ship Thru Codes: Ship Thru, Produced In Mexico And Shipped To Caseco Truck Body, St. Clair, Mo. / Returned To Wentzville Assembly For Shipping To Final Destination. Ship Thru Codes: Ship Thru, Produced In Mexico And Shipped To Brand Fx, Ft. Worth, Tx. / Returned To Arlington Assembly For Shipping To Final Destination. Ship Thru Codes: Ship Thru, Produced In Mexico And Shipped To Auto Truck, Ft. Worth, Tx. / Returned To Arlington Assembly For Shipping To Final Destination. Ship Thru Codes: Ship Thru, Produced In Mexico And Shipped To Knapheide, Red Oak, Tx. / Returned To Arlington Assembly For Shipping To Final Destination. Ship Thru Codes: Ship Thru, Produced In Mexico And Shipped To Ag Van/adrian Steel, Dallas, Tx. / Returned To Arlington Assembly For Shipping To Final Destination.